1 cup roasted Marcona almonds, or 3/4 cup almond flour. In a food processor, grind the almonds to a fine powder. Combine the ground almonds (or almond flour), butter, and sugar in a standing mixer fitted with a paddle. Cream on medium low speed until thoroughly incorporated, about 3 minutes. With the mixer running, slowly add the eggs to incorporate. Add the flour, a little bit at a time, stopping the mixer periodically to scrape down the bowl. Shape the dough into a ball and place between 2 pieces of parchment paper or plastic wrap. Refrigerate for at least 1 hour. Pre-heat the oven to 350 °F. Roll the dough on a lightly floured surface and cut out shapes for cookies, or make a tart shell. Bake until golden, about 15 minutes. In Recipes-list.com we have selected the most viewed recipes from category - uncategorized . Enjoy the best recipes specially selected for you! 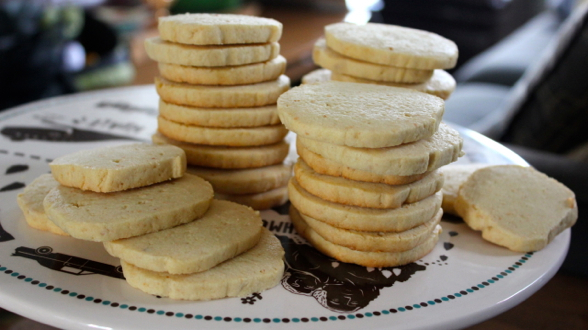 Almond Sablé Cookies is the right choice that will satisfy all your claims.